Gallstones are one of the most common digestive problems treated in women. More than 25 million people in the United States have gallstones, and 65% to 75% of them are women. Fortunately, for most people, gallstones are "silent" — they don't cause major symptoms. When they do act up, there are effective ways to address the problem. 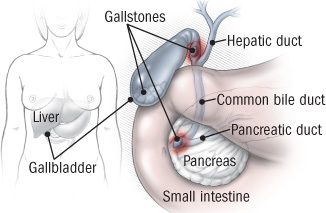 Gallstones begin with bile, a substance that helps with the digestion of fats and the absorption of certain vitamins. Bile is made in the liver and carried to the gallbladder, a small, pear-shaped organ that concentrates and stores it. The fat in food triggers the release of a hormone that causes the gallbladder to contract and release bile into the intestine. Gallstones are solid lumps that develop when the stored bile crystallizes. Most are less than an inch in diameter, but they can be as small as a grain of sand or as large as a golf ball. Most gallstones are composed mainly of cholesterol. The rest — known as pigment stones — are made of calcium salts and bilirubin, a breakdown product of red blood cells. Cholesterol stones form when liquid bile in the gallbladder contains more cholesterol than the bile salts can dissolve. Cholesterol stones may also develop if the gallbladder doesn't contract and empty as it should. Pigment stones are associated with certain medical conditions, including liver disease, some types of anemia, and infection of the bile ducts. Gallstones cause problems when they block any of the ducts carrying bile from the liver or gallbladder (or digestive enzymes from the pancreas) to the small intestine. It's the effect of female hormones. Estrogen increases cholesterol in the bile, and progesterone slows the emptying of the gallbladder. That may explain why the risk for women, relative to men, decreases with age. Before age 40, women are diagnosed with gallstones almost three times more often than men are (pregnancy, for example, increases the risk), but by age 60, their risk is just slightly greater. Estrogen therapy increases the risk, especially when taken as a pill rather than a patch. Oral contraceptive pills also increase the risk slightly, but only in the first decade of use. Obesity is another risk factor, because bodies with more fat produce more estrogen. Paradoxically, rapid weight loss also increases the risk, because very low-calorie diets interfere with bile production and therefore cause more crystallization of cholesterol. Gallstones are so common after weight-loss surgery that patients are often advised to have their gallbladders removed at the same time. Gallstones are also more likely to occur in people with diabetes or any condition that decreases gallbladder contractions or intestinal motility, such as a spinal cord injury. Finally, there's some evidence for genetic vulnerability to gallstone formation. Most people who have gallstones don't know it. Their gallstones stay silent and may only be discovered incidentally, through an ultrasound or CT scan performed for other reasons. Symptoms arise mainly when stones pass through a bile duct or obstruct it, causing biliary colic — better known as a gallbladder attack. These attacks occur when the gallbladder contracts (usually in response to a fatty meal) and presses the stones so as to block the gallbladder duct. The main symptom is pain, usually in the right upper or middle abdomen (just below the rib cage), which builds to greatest intensity within an hour and can persist up to several hours. It can be either sharp and knifelike or a deep ache; sometimes it radiates to the back or the right shoulder. There may also be nausea and vomiting. The pain subsides as the gallbladder relaxes. A stone lodged in a duct can also cause more serious problems, including acute cholecystitis (inflammation of the gallbladder), pancreatitis (inflammation of the pancreas), or cholangitis (inflammation of the bile ducts in the liver). Any of these conditions can cause severe pain and other symptoms, including jaundice, high fever, chills, and vomiting. Treatment usually requires intravenous antibiotics and often surgical removal of the stone. If you think you're having a gallbladder attack, your clinician will probably order several blood tests and an abdominal ultrasound (after you fast for at least eight hours). Ultrasound is particularly helpful in diagnosing acute cholecystitis because it also picks up any thickening of the gallbladder wall and indicates the presence of fluid, which may suggest inflammation. Other diagnostic techniques include cholescintigraphy, a radioactive injection used to view a possible blockage of the cystic duct; magnetic resonance imaging (MRI) of the bile ducts; endoscopic ultrasonography, which introduces an ultrasound device through the mouth, esophagus, and stomach to the duodenum (the first section of the small intestine) to get images of the area; and endoscopic retrograde cholangiopancreatography, which uses a scope inserted through the mouth to the duodenum to view the biliary ducts. Gallstones should be treated only if they cause symptoms. For recurrent gallbladder attacks, the most effective treatment is surgical removal of the gallbladder, or cholecystectomy. In the past, the standard procedure was surgery requiring a five-inch incision and a hospital stay of up to a week. This approach has largely been replaced by laparoscopic cholecystectomy, in which the gallbladder is removed with instruments inserted through small incisions in the skin. This procedure requires only an overnight hospital stay and a week of recovery at home. However, there's a slight risk of injuring the bile ducts, and in 5% to 10% of cases, the surgeon may have to switch to an open surgery with a larger incision because of complications. You can easily live without a gallbladder. The liver produces enough bile for normal digestion. When the gallbladder is removed, bile simply flows directly into the small intestine through the common bile duct. When no food is present, loose stools may result, but you can treat that with a bile acid–binding medication, such as cholestyramine (Questran, Locholest). If you can't or don't want to undergo surgery and your gallstones are small, one option is to take ursodiol (Actigall, Urso), a naturally occurring bile acid that helps dissolve cholesterol stones when taken by mouth two to four times a day. It's also used to prevent the formation of gallstones in people who are losing weight quickly. Ursodiol dissolves only those gallstones made of cholesterol, and it may take several months before it has an effect. Drug therapy is occasionally combined with lithotripsy, in which sound waves from outside the body are used to break gallstones into pieces that dissolve more easily or are small enough to safely pass through the bile duct. Unfortunately, stones are likely to recur after medical treatment. How can I reduce my risk for gallstones? There's no proven way to prevent gallstones, but research suggests some possibilities. Eat three well-balanced meals daily, maintain a normal weight, and get regular exercise (at least 30 minutes a day most days of the week). Several studies have linked moderate alcohol consumption to a lower risk for symptom-causing gallstones. The Nurses' Health Study also found that women with more fiber in their diets and those who ate several 1-ounce servings of nuts per week were less likely to need gallbladder surgery. Avoiding fatty foods won't prevent or get rid of gallstones, but it may reduce the frequency of attacks.